The Men had a great and spiritually positive time at the Men's Advance in Bodega Bay. Many moved much closer to the Lord and He spoke many positive and powerful things into our lives. Thank you ladies for letting us grow! Just a reminder to all men. 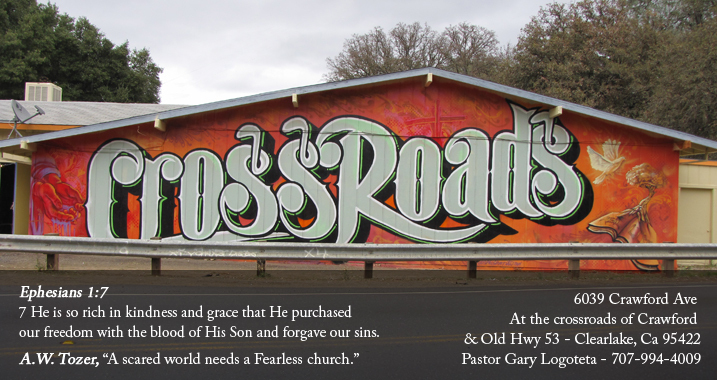 The 5th Annual Crossroads Men's Advance is coming on June 7-9, 2019 in Bodega Bay. The cost is only $125 and that covers everything! The last 4 years have been fantastic spending time with other men and getting deeper with Jesus. The speakers will be from 2 churches in Clearlake and one in Rohnert Park. This is a great time of Fellowship, Great Messages and a deeper intimacy with Jesus. We will advance to His desire for men to stand up take the lead, as MEN should, so that our spouses and church family can be secure in our love and protection for them and our commitment to Jesus! Message me if you want to be a part of this life changing Advance. We need to have a $25 non/refund deposit.